On nights that I want to do soup and sandwiches, this crock pot chicken vegetable soup is THE perfect fall/ winter soup. It’s very brothy, yet hardy. Our favorite way to eat it is with peanut butter and honey sandwiches (makes me think of the cafeteria sandwiches when I was in grade school (do y’all remember those?). 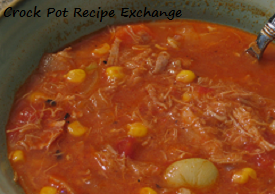 Pour the tomatoes into a 2 – 3 quart crock pot. Add the chicken, frozen veggies, cabbage, chicken broth, salt and pepper. Cook on high for 3 – 3 1/2 hours or on low for 4 1/2 – 5 hours. Serve with your favorite sandwiches. It usually serves 3 – 4 people. This recipe is shared at Hearth ‘n Soul and Foodie Friday.